Hijab Winter Style. All the fashionista hijabis looking for latest winter hijab styling trends and ideas on how to style hijab in winter with other outfits, this post is for you. 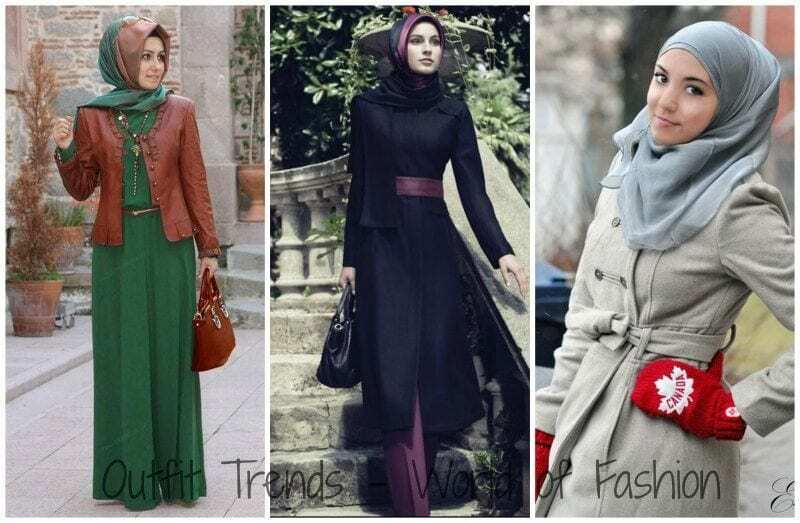 Outfit trends bring 14 trendy hijab outfit combinations for this winters. Stay tuned. Winters are already here and its time to take out the warm outfits or to buy some new collection. With time dressing up properly is becoming essential to look good. Good sense of dressing can also boost up your confidence and make you stand out in the crowd. Since 2013, the change has begun for the need of wearing hijab. It has become a part of our style statement. Hijab has become a part of our daily wear and wardrobe. Hijab means modesty which reflects one’s iman and character. Tying up a hijab in the right way is very necessary and important. Hijab needs to be neatly worn on our head. Hijab has a thousand times more beauty than a crown on our head. Today we will tell you some famous trendy Hijab Styles Tutorials for winter, and you will find the complete solution of tying up the hijabs in a different way. Hijabs can make your personality more modest and elegant. Hijab is a symbol of modesty for Muslim women, but it can be styled in different ways with different outfits to make one look more glamorous. Earlier we have also talked about ‘How to wear hijab elegantly’. There are plenty of options to style hijab with a shirt, coat, sweater, long maxi, a shirt and a jacket on top. For your simple day to day routine, you can wear a full sleeves shirt with a sweater on top and any floral printed hijab. There are several designs in printed headscarves. You can easily get the fabric in markets. All you need to do is a little research to find a fabric that goes best keeping the weather and your skin tone in mind. In winter, dark colors are highly recommended. There are a lot of printed hijab designs these days like animal print, floral print, cartoon designs, funky prints hijabs etc. So don’t just follow the mainstream hijab fashion. You can always try and experiment with new designs which are pretty trendy these days. For a street style look in winters, we have already shared 14 popular ideas in this post. From the following images below you will get plenty of ideas on how to style hijab in winters and what outfit to wear with and much much more. Let’s see the collection now. ↓ 10 – Hijab with Leather jacket. The best thing about a black leather jacket is that you can pair it with absolutely any outfit and any hijab style and colour. They are thus great for travelling as you won’t need to pack a lot of stuff if you have a nice black jacket to go with all your vacation outfits. The another most simple styling tip in winters is to wear a long cardigan. That is ideal for day to day casual routine. 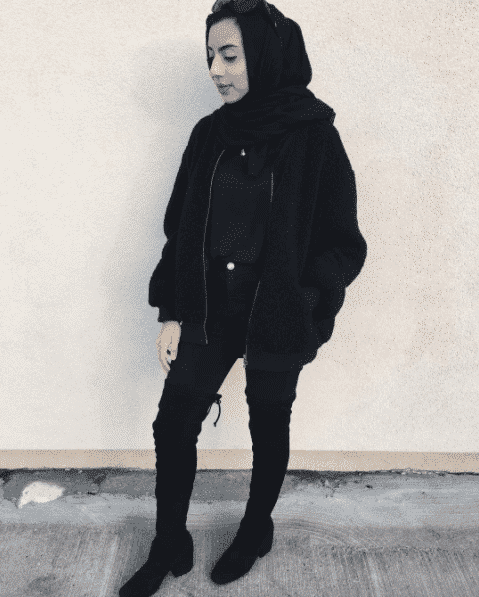 ↓ 1 – Funky Hijab style in winters. This girl is pairing hijab with a long fur coat, funky top and tulle skirt.W e already discussed some great ideas for funky hijabi style in this article. We hope that you will get enough ideas from the pictures. Don’t forget to experiment different looks on yourself. I am sure all these ideas will help you, and you can easily dress up well. You could also carry an accessory to complete the look. The styles look perfect Masha’Allah. I really loved the ideas. These are absolutely not ‘islamic’ hijab. No pure and modest at all. Dislike!